This is another Martha Stewart dish that I tried out recently and I am truly amazed by her recipes. They are easy to follow, and so far all of them had exceeded my expectations. If you are lover of cheese and potatoes, this is definitely a must-try dish, though it will take some time to cook in the oven, the assembly is really easy and quick, the hardest probably being arranging the potatoes in a nice pattern! I actually arranged it, took them out and rearrange the potato slices a few times before I am satisfied haha. I baked this for myself as a main but you can definitely up the amount for a larger crowd and/or serve it as sides. Butter the dish generously – butter is very yummy! 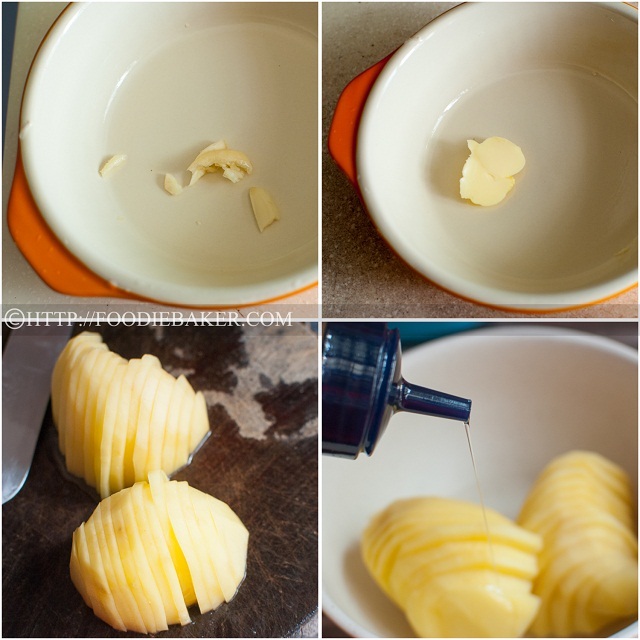 Peel and slice the potatoes thinly – you want them maximum 1/8-inch thick so that it’s easier to arrange them. Add in cheese and season well with salt and black pepper. You can throw in herbs if you’d like. And let’s arrange! I start by placing a layer of potatoes (not overlapping) as a base. Followed by a ring of potatoes overlapping one another. And it goes on until all the potatoes are used up. Sprinkle more cheese on top and add in chicken stock before baking. I am submitting this recipe to Cook Like A Star, an event hosted by hosted by Zoe from Bake for Happy Kids, Baby Sumo from Eat your heart out and Riceball from Riceball Eats. The event is hosted every bi-monthly and the theme for this month is Martha Stewart. If you’re interested in joining us, simply bake/cook a recipe of Martha Stewart and submit it via the linky at the bottom! On a separate note, I would like to thank Johnny from Feed the Piglet for awarding me with Blog of the Year Award! It is truly an honour to be able to receive this award, and none other from Johnny himself! Johnny trained as a chef but he blogs mostly about food that he prepares at home, and they all look mouth-watering delicious, like his Chicken Piri Piri, Stuffed Capsicums… Also, he doesn’t mention it, but sometimes I think he secretly trains himself as a photographer too, because I’m love the way he composes his food shots – if you’d just hop over, you’ll know what I’m talking about. 😉 Thank you Johnny, for giving me this award! I got to know these 3 amazing ladies this year after I started participating in the events (Bake Along) hosted by them. They have been a great source of inspiration and because of them, I’ve tried baking so many different types of desserts this year. I’m sure in the coming new year, they will continue to be my greatest source of motivation to bake along with them! I’m sure many of you are very familiar with Bobbi – Bobbi is a true wonder-mom – she juggles studying Chinese medicine, taking care of her teenagers and blogging all at the same time! I love the way she blogs and many times I will be laughing when I’m reading her posts. Her international dishes are also mouth-watering delicious – from Chinese to Korean to Japan and even Italian – she has all these recipes in her blog, definitely a must-visit. Barbara is yet another amazing lady whom I got to know recently. She composes poems, bakes delicious desserts and takes very beautiful photos of food and her surroundings – one cannot help but enjoy and be hooked reading her blog. Like what she said about herself – a poet, artist, photographer, aspiring cellist and bon vivant – she definitely is one! 3. Please include a link back to this page ‘Blog of the Year 2012’ Award (http://thethoughtpalette.co.uk/our-awards/blog-of-the-year-2012-award/) and include these ‘rules’ in your post (please don’t alter the rules or the badges!). 5. You can now also join our Facebook group – click ‘like’ on this page ‘Blog of the Year 2012’ Award Facebook group and then you can share your blog with an even wider audience. And now, on to the recipe! Preheat the oven to 200 degrees Celsius. Rub the crushed garlic all over 2 small baking dishes (bottom and sides) and discard the garlic. Butter the baking dishes with the ¼ tablespoon butter. Set aside. 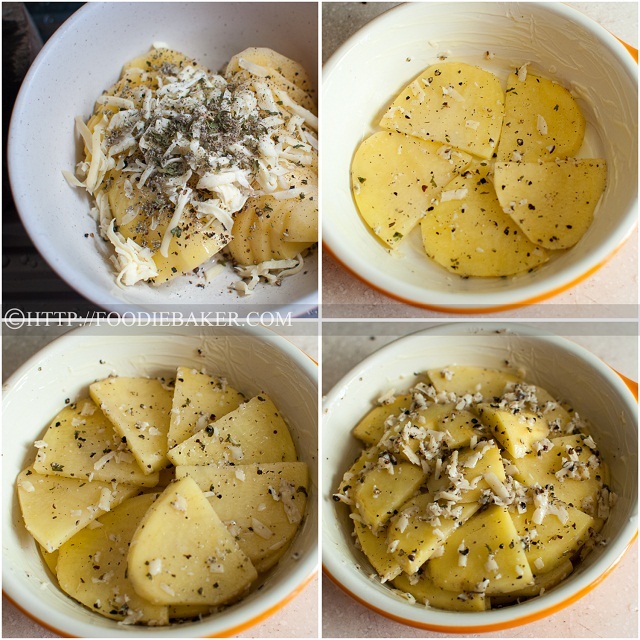 Toss the sliced potatoes with ½ of the cheese, olive oil, herbs, salt and black pepper in a small bowl. 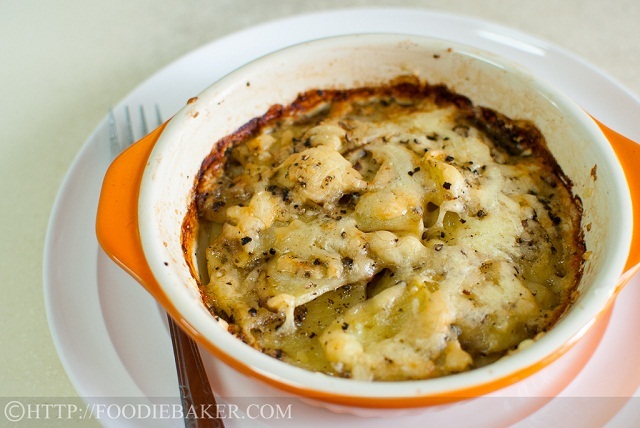 Lay the potato slices in the baking dishes (with the cheese and all), sprinkle with the reserved cheese. Divide the chicken stock between the two baking dishes and pour it in. Bake the potatoes in the middle rack for 35 to 45 minutes until the potatoes are tender, tenting with foil if the top is getting too browned. Serve warm. Congratulation with your award. You are truly fantastic with your cooking and baking and your photography is always first class! I’ve just had breakfast over here but your food is making me hungry!! hi jasline, first of all, your photography skills are superb! thanks again for passing me another award, i have yet to display the last few few awards you hv given me but i promised i will do so. It’s has been great baking along with you for this whole year , you’re an inspiration for me too! I am truly honoured to receive this blog of the year award, thanks again very much! I love the simple recipes from Martha Stewart’s website too.. so easy to prepare and delicious! The gratin looks very delicious! Congratulations on your award, and I am also glad to have met Zoe, Joyce and Lena as well! And thanks for introducing Bobbi and Barbara’s blog to us! Potatoes and cheese are indeed meant for each other, the gratin looks delicious, I know that I would have no problem finishing it up! Yum, and you’ve arranged the potatoes very nicely! Congratulations on your award! And thank you for passing it on to us. It is a pleasure having you baking along with us, you are a talented baker, ever so patient in providing the full steps-by-steps photos for all bakes! I certainly look forward to another year of wonderful baking together! Cheers! Wish you A Blessed and Wonderful 2013! This is such a great way to prepare potatoes, Jasline. I must admit that I’m not one to arrange the potato slices so fancifully but I do prefer to use Gruyere cheese. I’ve a feeling these are going to grace my table very soon. Thanks! Hi Jasline, congratulation on your award. Keep up the good work. Thrilled that you’ve accepted this. 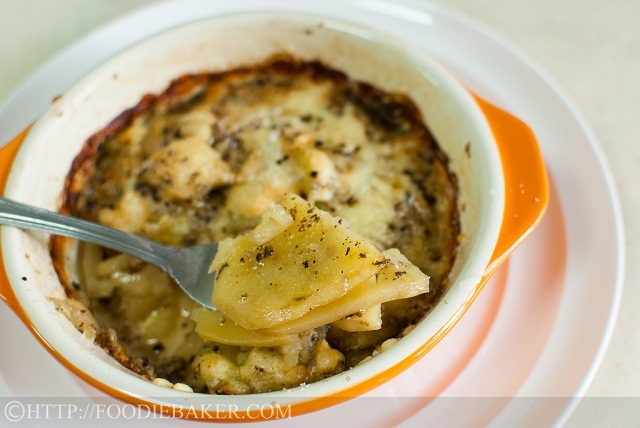 Especially as you’ve also included a potato and cheese gratin, surely one of my favourites. Thanks for such a nice intro – I really should do that with the blogs that have nominated me. Yikes! I always love potato dishes, especially when there’s cheese involved.